From the tour in support of their 4th album, "Gentlemen Take Polaroids", comes this FM radio recording featuring a selection of tracks from their live set. Its interesting to compare this performance with the later Japan show I did, from their last tour before splitting up. They have far more vibrancy and enthusiasm here, I think. The recording needed a bit of repair but responded well to remastering and has proved very popular among Japan fans. Hi - yep, keep checking back. All the concerts will be being re-upped in he next week or 2. Number 1 through 29 (including this one) will be available as 320 kbps downloads for the first time. 30-45 will have the original 320 files re-uploaded. Cheers! Nice set cheers for the Japan. I think I was there for tat concert. Cheers for the feedback; glad you enjoyed. Really nice recording, but I have a request for future uploads: leave a second or two of blank space between your intro and the beginning of the actual recording. Thanks! And see the remasters edited and passed around the internet by others claiming as their own? Nope, that's not going to happen, sorry. There are some shows where there is no ambient noise at the start of the recording. But otherwise - no, sorry. Thanks for the show flip. Enjoyed your other Japan re-master so looking forward to this one. It was, I believe, yes. 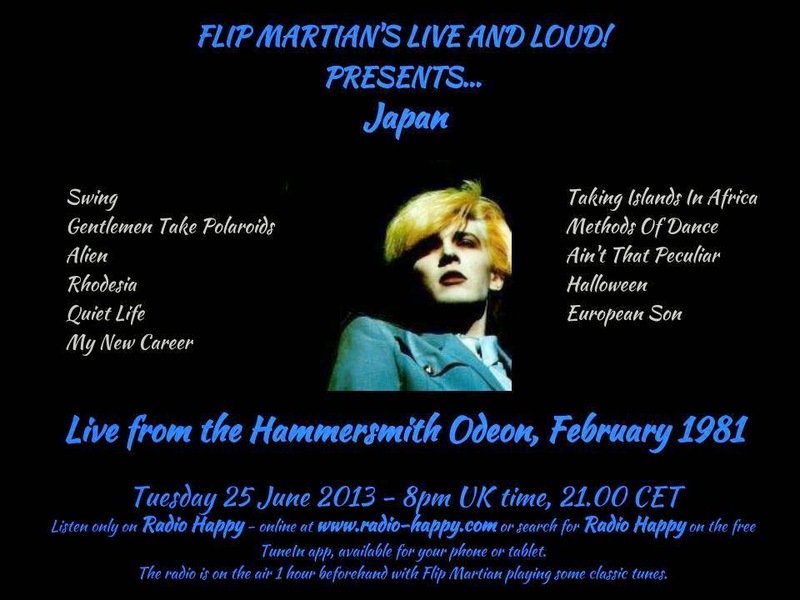 There are 2 other Japan gigs on the archive - just look for Japan down the right hand side). And there is likely to be another later this year. Thanks for the feedback! Another well-burnished show, many thanks for providing it to us all. Japan's career was interesting. At the point this was recorded, they had garnered a large, early-teenage, mainly-female fanbase, probably owing to the band's change to a newly radio-friendly sound and to Sylvian's image. Yet their arty pretensions (nothing wrong with that) were far removed from the standard of that genre. On this recording we can hear the audience screaming in ecstasy at anything Sylvian says between songs. Their split not long after the next album must have annoyed not only this fanbase but the rest of the band, too. There's a big difference I think in the band between this gig and their last gig in 1982 (also on this site) where they sound tired and just...unenthusiastic. Big shame, I think they were on top of their game here.